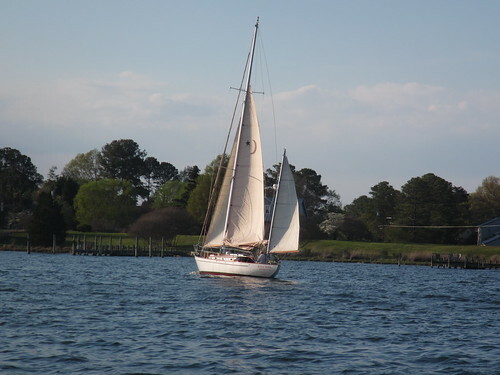 Well we didn’t get to sail much, and the current was against us the whole trip up the Chesapeake, but we made it. The winds died, and then switched to the West so we were trying to sail all day. Then about 2 hours before we got to Fishing Bay the winds came up to over 30 knots on a close reach. We hit 7.8 knots into 0.5 knots of current and once again the boat is covered in salt spray. All of that nice rain wash last night was for naught. The anchorage here is large and fairly well protected. There are three other boats here rafted up. Hopefully their anchor set is good. We will get an early start tomorrow and head for Solomons. The winds are forecast 10-15 against us, but at least we will have the current with us tomorrow. Time for a glass of wine! 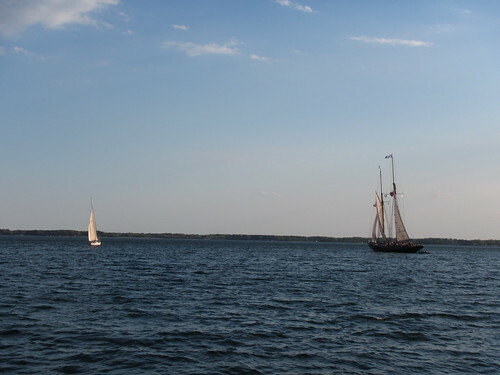 And for entertainment tonight we have a classic Concordia Yawl and the Virginia tall ship Virginia out for an evening stroll.